Figure 16. 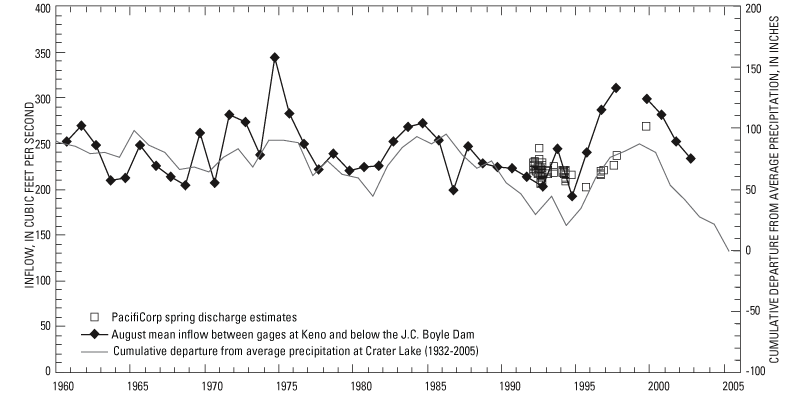 August mean gains in flow (a proxy for ground-water discharge) between Keno (USGS gaging station number 11509500) and the John C. Boyle power plant (11510700), estimates of inflow by PacifiCorp, and the cumulative departure from average precipitation at Crater Lake, Oregon. (PacifiCorp data from Rob Allerman, written commun., 2002).